ITTA BENA, Miss.— Life can change in an instant and for Mississippi Valley State University (MVSU) graduate Oriana Bledsoe that change has manifested into a dream come true. 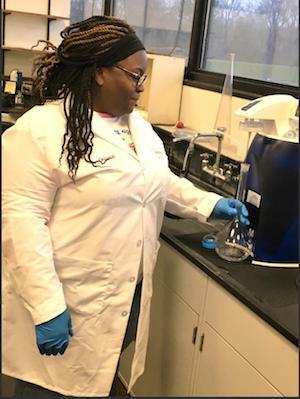 In November 2017, Bledsoe became the first MVSU student to be selected to participate in the City of Jackson’s Wastewater Treatment Facility (CJTWF) internship program through its environmental partnership with Veolia Water North America – South, LLC. This program is offered in collaboration with Multi-Energy Group (MEG), LLC. A woman and minority-owned business, MEG is an engineering and program management company that provides professional consulting services to both the private and public sectors. Bledsoe finished her degree at MVSU in 2009 earning her Bachelor of Science degrees in both chemistry and biology. Following her stint as a teacher, she decided to alter her career path and pursue a master’s degree in Environmental Science from MVSU. At the completion of her internship in May 2018, Bledsoe accepted a full-time position with the Veolia. Kelvin Peters, Veolia’s senior project manager, said the company affords college students career opportunities that many may not have been aware of prior to gaining an internship. “There is an abundance of career opportunities in the areas of operations, laboratory analysis, and maintenance. Veolia is afforded the ability to expose college students and other interested citizens in the community to these opportunities,” Peters said. “A bonus is the fact that interns can earn a reasonable wage through their participation and gain invaluable work experience while continuing their education. Through this program, they are then able to relate their experiences to their peers who may not have been previously aware of the possibilities of such a career and thus indirectly increase interest in the environmental occupations,” he added. During her time with Veolia, Bledsoe said she has grown professionally and has gained a better understanding of the field. Patrice Greenwood, V.P. Project Management at MEG, said that the primary objective of the year-round internship program is to provide long-term exposure to complex assignments, which enables the interns to apply theoretical and practical knowledge learned in the classroom to the work environment. Greenwood said she’s been impressed with Bledsoe. Dr. Hattie Spencer, an associate professor in MVSU’s Department of Natural Sciences and Environmental Health, said she was thankful for the program and its impact on MVSU students. To learn more about MVSU’s Environmental Health Program, call (662) 254-3377 or visit www.mvsu.edu.